On May 24th, 2014, the lads and I watched Real Madrid win La Decima at Real Sports Bar in Toronto. The historic nature of that victory overcame us all as if we were Madridistas ourselves. As we all know, Atletico Madrid were one minute away from pulling off what would’ve been an inspiring victory for the underdog. Sergio Ramos and Angel Di Maria had other ideas and by the time Cristiano Ronaldo had wrapped up the victory with a late penalty in extra time, Carlo Ancelotti was a hero. No matter what happened after that point, Carlo would go down in history as the man who delivered La Decima. Since Vicente Del Bosque was unceremoniously sacked by Florentino Perez, ten others tried but all fell short including Jose Mourinho. Ancelotti topped them all and wrote his name into Real Madrid legend. That may be the worst reason I’ve ever heard for terminating anyone’s employment. This was a team that won 22 games on the spin. Madrid only lost La Liga by two measly points – a result of injuries to three key performers in Luka Modric, James Rodriguez and Karim Benzema. If Barcelona suffered injuries to Ivan Rakitic, Andres Iniesta and Luis Suarez for the extended period that Madrid lost the aforementioned players, we would be talking about Real Madrid as champions. It was Perez who mishandled the summer transfer window. Combine that with the incredible injury situation and Carlo Ancelotti’s side just couldn’t cope. None of this was the Italian’s fault. Simply put, Carlo Ancelotti has been treated like a peasant. The worst part is, he’s been harshly treated on more than one occasion. Somehow he overcomes. Half way into the 1998-99 campaign, Marcelo Lippi was sacked after what was a disastrous first half of the season for defending Serie A champions Juventus. Ancelotti replaced Lippi, and went about fixing the mess his predecessor left behind. The league was unsalvageable, but in the Champions League the team earned people’s respect. If not for Roy Keane and the destined Manchester United treble side, Ancelotti’s men would’ve reached yet another Champions League final. It was not to be. Juventus finished seventh in Serie A, but the team had shown enough promise to give fans hope for the year to come. Unfortunately, Juventus endured an embarrassing UEFA Cup campaign that season, going out in the round of 16 after being humbled 4-0 by Celta Vigo. However, the Bianconeri marched on in the league. The title was decided on the final day with Juventus losing against Perugia in a game that should never have been played due to near monsoon conditions. Ancelotti’s men finished the season a solitary point behind eventual winners Lazio. His team still won enough credit to warrant another season in charge, but that didn’t go to plan either. The following year, Juventus were eliminated in the Champions League group phase and lost Serie A to another capital club, Roma. It was to be the final straw. Two troph-yless seasons were intolerable for a club of Juventus’ stature back then, and I completely agree with the club’s decision at the time to sack Ancelotti. The issue is how they went about it. Ancelotti’s sacking was announced at half time during the last game of the season. If you’re looking for a way to demean someone, that’s the way to do it. Call a guy in to work, act like everything is okay, then sack him at lunch? Why make him come to work in the first place? Apparently it was well known by then that Ancelotti would to be sacked anyway, so why humiliate him? The sheer level of disrespect shown by the Juventus execs in perpetrating this act leaves me with a sense of astonishment. The worst part? They tried to pass the blame on to others. Mr. Agnelli forgot to mention that the board was against him too, but I guess you do whatever you have to do, right? Of course, Ancelotti bounced back winning the Champions League with A.C. Milan in 2003 against Juventus in Manchester. Sweet revenge for his poor treatment. After a trophy-laden spell with Milan which included two Champions League titles, one Serie A and one Coppa Italia, Ancelotti left for yet another new challenge. That would be in England, taking the reins at Chelsea. Things started off brilliantly. In his first season, Chelsea managed to pip Manchester United to the Premier League trophy. United looked odds on to win the league with Wayne Rooney in world class form, but they couldn’t sustain it and Chelsea took advantage. The Blues secured the title on the final day of the season, beating a hapless Wigan side 8-0. As a result, Chelsea won the league by one point but set a Premier League goal-scoring record with 103. Carlo wasn’t done there. He went on to win the FA Cup that season, beating a soon-to-be-bankrupt Portsmouth 1-0 in the final. Ancelotti had achieved Chelsea’s first ever league and cup double. The following season, though, it all went wrong. Roman Abramovich strangely didn’t back his manager in the transfer market during the summer, only bringing in Ramires for big money. Chelsea toiled that season and by January were looking a bit off the pace. Fernando Torres was brought in above the manager’s head to be Abramovich’s play thing. Ancelotti couldn’t get the best out of the misfiring Spaniard, whose downward spiral has now become folklore. By season’s end Chelsea finished second, nine points behind Manchester United. Yet instead of backing the manager with better players, a childish executive threw his toys out the pram and sacked Carlo two hours after the final whistle on the last day. Ancelotti was due to meet with the Chelsea hierarchy to discuss his future the following week. Roman had other ideas. Chief Executive Ron Gourlay intercepted Ancelotti as he was entering the media suite and informed him that his time at Chelsea was over. Finishing second to Sir Alex Ferguson was nothing to be ashamed of, especially after making history by winning the double the previous season. The Italian left with his head held high, and of course Carlo would go on to make history again. In the 2012-2013 season Carlo Ancelotti became the darling of Paris by bringing the Ligue 1 trophy to the capital for the first time in almost two decades. The team was expensively assembled, lead by Zlatan Ibrahimovic, Javier Pastore and Thiago Silva. As liked as former manager Antoine Kombouare had been, PSG needed a proven, high profile leader to handle the big name stars and – of course – for marketing purposes. The side surprised everyone by reaching the Champions League quarter finals, narrowly losing to Barcelona on away goals. Ancelotti certainly delivered what was required of him and PSG fans will never forget his tenure. His proven track record and penchant for making history lead Real Madrid to request his services. Carlo took what he thought was a dream job. 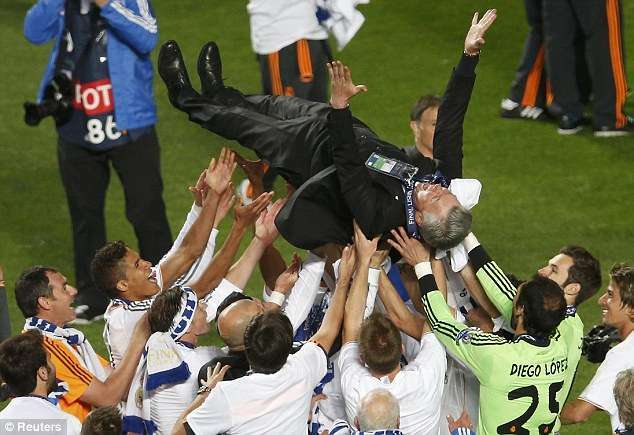 On May 24, 2014, Ancelotti fulfilled a personal milestone by winning a third Champions League trophy, surpassing Ferguson, Mourinho, Guardiola and Heynckes. He fulfilled the dreams of Madridistas all over the world by delivering La Decima. A year later, his worst nightmare came true. The era of Ancelotti is over and it looks like Rafa Benitez will take over as head coach of Real Madrid. Through Twitter, Ancelotti has spoken kindly of his time at Real Madrid and of the board. Frankly, it’s a diplomatic statement he’s made time and time again after being treated poorly. He makes no fuss and moves on. Carlo is used to this treatment but he always comes out a winner. For that, we have nothing else but the utmost respect. Follow us on Twitter at @under_thecosh to never miss an update. Ancelotti is like a 200lb jockey riding a pure bread Triple Crown stallion (RM team). He is getting fat!